Each campfire can accommodate between 30 to 50 people. - Sufficient wood for the campfire. Groups may bring additional seating, if desired. Guests who rent a campfire are welcome to bring coolers of drinks, hot dogs, marshmallows, etc. Alcoholic beverages are NOT permitted on the farm! Remember to bring cooking utensils like metal skewers for hot dogs and marshmallows. Wooden roasting sticks will be available for purchase at the farm for $0.50 each. Individually packaged s'mores kits available for $2.50 per person. Includes graham crackers, marshmallows and chocolate bar. S'mores orders must be placed at least 7 days in advance by calling 301-620-9316 and will be paid for at the time of pick up at the farm. S'mores packages are not included in your ticket price. 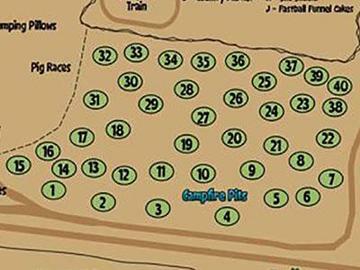 Campfires will be started and maintained by Summers Farm personnel. Smoking and alcoholic beverages are NOT permitted at the farm.